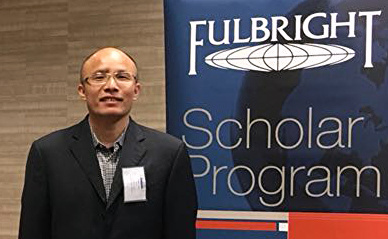 Fanbin Zeng of China, a 2017 Visiting Fulbright Scholar, is coming to PCC. Sponsored by the college’s Academic Affairs and the Internationalization Steering Committee, Zeng will discuss social media in China. Zeng, who teaches at the University of Wisconsin-Madison’s Department of Communication Arts, will be visiting PCC on May 23-24 and presenting four times during those days. It will be an informative lecture. Zeng has been awarded several research grants on the relationship between Internet use and political participation in China. In addition, he has published several books and various original articles in top Chinese journals. 1-2 p.m., Wednesday, May 23 — College Center Mall, Sylvania Campus. 2:50-3:50 p.m., Wednesday, May 23 — The Forum, Building 3, Rock Creek Campus. 9-10 a.m., Thursday, May 24 — Performing Arts Center Lobby, Sylvania Campus. 11:40 a.m. to 12:20 p.m., Thursday, May 24 — Room 112, Terrell Hall, Cascade Campus. These lectures are conducted through the Fulbright Scholar Program’s Outreach Lecturing Fund, which enables the scholars to share their research interests, speak about their home country, and exchange ideas with U.S. students, faculty, and community organizations. Zeng received his bachelor’s degree in Finance from Shanghai University, his master’s degree in Communications from the Graduate School of Chinese Academy of Social Science, and his doctorate in Communications from Renmin University. He has been teaching and conducting research at the College of Journalism and Mass Communication of Jinan University since 2004. This was an excellent learning opportunity for my Comm Studies & Journalism media class. We had robust discussion about the information presented, particularly around the issue of government censorship. My ESOL Writing 8 class really got into the ideas and different sides of the issues of control, social movements, and more. We’ve been exploring issues about social media and the effects of technology on society, and the presentation and questions also gave us lots to consider about forming an argument and responding to questions. Thank you!